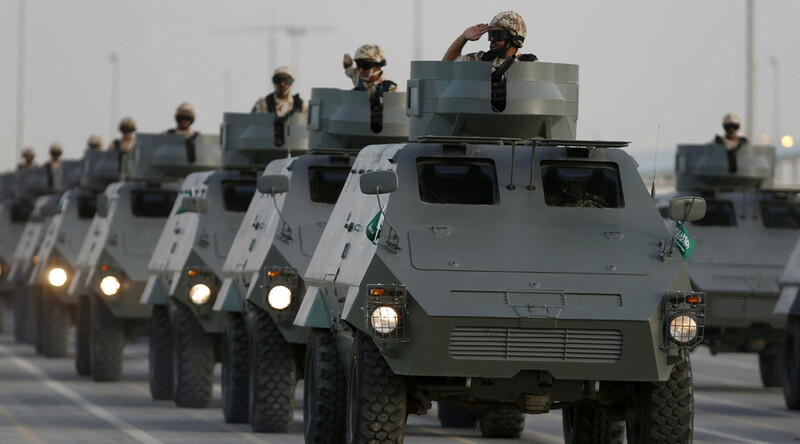 A Riyadh-based “Islamic military alliance” has been formed to fight terrorism, Saudi Arabian state TV has announced. The coalition consists of 34 countries, including the Gulf States, a number of African countries, Turkey, Egypt, Malaysia and Pakistan. The new alliance’s initiatives could potentially include troops on the ground, Saudi Foreign Minister Adel al-Jubeir told reporters at a briefing in Paris on Tuesday. “There are discussions [among] countries that are currently part of the coalition [like] Saudi Arabia, the Emirates, Qatar and Bahrain about sending in some special forces into Syria,” Adel al-Jubeir said, as cited by Reuters. “Nothing is off the table,” the minister said, adding that “it depends on the requests that come” and that the picture should become clearer within the next few weeks. Countries involved in the coalition aside from Saudi Arabia, include Jordan, the UAE, Pakistan, Bahrain, Bangladesh, Benin, Turkey, Chad, Togo, Tunisia, Djibouti, Senegal, Sudan, Sierra Leone, Somalia, Gabon, Guinea, the partially-recognized state of Palestine, the Islamic Federal Republic of the Comoros, Qatar, Cote d’Ivoire, Kuwait, Lebanon, Libya, Maldives, Mali, Malaysia, Egypt, Morocco, Mauritania, Niger, Nigeria, Yemen. “The countries here mentioned have decided on the formation of a military alliance led by Saudi Arabia to fight terrorism, with a joint operations centre based in Riyadh to coordinate and support military operations,” state news agency SPA quoted an official statement as saying. The statement added that the coalition has “a duty to protect the Islamic nation from the evils of all terrorist groups and organizations whatever their sect and name which wreak death and corruption on earth and aim to terrorise the innocent,” Reuters quotes. The coalition’s headquarters will be based in Riyadh, Saudi Arabia’s capital. Currently, there are a number of active coalitions fighting terror groups such as Islamic State (IS, Daesh, formerly ISIS/ISIL) in Syria and Iraq. The US-led coalition has gathered the support of at least 65 countries. However, various media reports have claimed that fewer than a dozen states are actually contributing, with American jets carrying out most of the strikes. Moreover, the coalition has received international criticism for being ineffective. “We can state the [US-led] coalition is simulating the fight against ISIS and real terrorism and acts on its own politicized approach to the situation, which runs counter to international law, at least in Syria. Now we can see that [this happens] not only in this country. As is known, the inactivity of the actions of the [US-led] coalition was distinctly confirmed by the growing ISIS problem,” Russian Foreign Ministry spokesperson Maria Zakharova said last week. The US-led coalition’s airstrikes in Syria have never received permission from Syrian President Bashar Assad to enter the country’s airspace. Meanwhile, Russia has been conducting its own airstrikes targeting IS and other terrorist groups in Syria since September 30. The strikes were launched at the formal request of Damascus. Russian jets have been carrying out sorties from Moscow’s Hmeimim Air Base in Latakia. The Russian-led operation also involves coordinating its efforts with regional governments, including those of Syria, Iran and Iraq, which is known as the RSII coalition. Russia has been calling for a global coalition to fight IS. Russian President Vladimir Putin said in November he wanted global cooperation to combat terrorism. Russian Prime Minister Dmitry Medvedev has echoed Putin’s words, stressing that countries with large Muslim populations, Russia among them, should team up against the terrorist groups. Meanwhile, a Saudi-led coalition has been bombing Yemen as part of a campaign against the Houthi rebels that ousted president Abd Rabbuh Mansur Hadi. The latest statement from the coalition said a ceasefire is due to be established Tuesday. “The command of the coalition forces announces a ceasefire as of 12 pm Sanaa time ... while retaining the right to respond to any breach of the ceasefire,” the Saudi state news agency SPA quoted. Saudi Arabia has been carrying out assaults on the Houthis, who continue to hold the Yemeni capital of Sanaa. The conflict has created an emergency situation, with UN agencies raising alarms that millions of Yemenis are in mortal danger of starvation. Nearly 6,000 people have been killed in the Saudi-led airstrikes and fighting.